Electronic Switches offers Safety Light Curtains with all the Safety Features. We provide CE Approved Safety Curtains with all the safety standards for Finger, Hnad and Body Safety. We also offer various customized solutions using safety Light Curtains. Electronic Switches offers new generation Safety Light Curtains / Safety Guards based on advanced micro controller technology. These are available in two types. Parallel Beam ( LC : type II beam ) and Cross Beam ( LX : type x beam ). For the same protected height, Cross Beam Light Curtains are more sensitive as there are more number of active beams in the same area. Easy to install & may be mounted in any position with non-critical alignment between sensors. Switches are provided for blanking / by-passing individual channels. Various barrier range heights are available from covering 100 mm to 1000 mm . Higher covering heights available upon request. Use of solid state components & special construction technique ensures that barrier Is not affected by normal vibrations & shocks. For Sensors, connections are provided through plug in connectors. Self Checking Circuitry continuously monitors failure of any of the beam in the system and stops the machine if failure detected. LED indication for output and sense. Sensing Distance Min. 300mm and Max. 1 mtr. Response Time 10 - 20 m Sec. Owing to the expertise of our professionals, we are proficient entity, engaged in providing a superior quality assortment of Finger Safety Light Curtain. Our provided light curtain uses latest micro controller technology and offers maximum safety and protection to the fingers of operator. Offered light curtain perfect for small presses, hammers, crimping machines, spot welding machines, riveting machines where the risk of operators finger meeting with an accident is very high. Overall Sensor Height : 170 /250 mm approx. We are recognized as the leading organization for offering of premium quality Safety Light Curtain Output that is featured with blanking / by-passing individual channel is provided through software. This product is unaffected by mains power fluctuations. Machine OFF if screen is too dirty or oily. Offered product is accessible in numerous specifications so as to meet the demands of customers. Besides, LED Indications are provided for status indication of each channel. Easy to install & may be mounted in any position. Easy to install & may be mounted in any position. Vertical or Horizontal. Non-critical alignment between Emitter & Receiver. Blanking / by-passing individual channel is provided through software. Unaffected by mains power fluctuations. Machine OFF if screen is too dirty or oily. Barrier operates on cyclic scanning photo electric infra-red techniques. Various barrier range heights are available from covering 90 mm to 1710 mm . Higher covering heights available upon request. For Sensors, connections are provided through plug in connectors.- Self Checking Circuitry with two outputs continuously monitors failure of any of the beam in the system and stop the machine if failure detected.- LED Indications are provided for status indication of each channel.- LED indication for output and sense.- Choice for suitable Control Unit available to suit different working conditions.- Flexible fixing arrangements to suit individual requirement.- Increases productivity while maintaining required safety. Electronic Switches (India) Pvt. Ltd; offers WATERTIGHT HOUSINGS for Safety Light Curtains as shown is photograph. Such housing is required for Emitter and Receiver separately. With such watertight housings, Safety Light Curtains can be used in the area where water is being used extensively for cleaning in nearby area. Without watertight housing, water droplets enters housing of safety light curtains and damages/stops functioning of product. As Safety Light Curtain is housed inside Watertight Housing, water droplets cannot affect the functioning of the product. The Vibration Dampers are used for fixing the Safety Light Curtain Vibration Dampers are specially designed to avoid mechanical damage to Safety Light Curtains when installed on machines which has high vibration level. A set consists of two pieces and TWO sets will be required for fixing light curtains, one set for emitter and one set for receiver. Thread size is 5 mm and available thread length is 4.5 mm. To avoid mechanical damage to Safety Light Curtains when installed on machines which has high vibration level. Electronic Switches now offers very sleek type safety curtains. This are used where there are space limitations. By keeping track with the market developments, we are offering an extensive range of Safety Light Curtain. The offered light curtain consists of two push buttons and a controller. When both the push buttons are pressed, the output relay from the controller gets ON. In addition, for pneumatic / hydraulically operated presses safety light curtain can be easily installed. Our customers can avail this light curtain from us in different specifications. MODEL : THS 02 - The controller is having facility to connect two push buttons, facility of connecting Safety light curtain is not provided. MODEL : THS 03 - The controller is having facility to connect two push buttons AND facility of connecting Safety light curtain . Caution - In case of mechanical press, the ram can not be stopped once it has been started from TDC. It can not be stopped in between. This is the limitation of press itself. However the stroke would not start if hand is obstructing the beam. For pneumatic / hydraulically operated presses safety light curtain can be easily installed. However it can not be used directly for mechanical press. 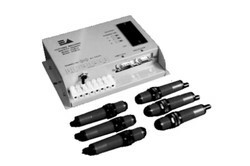 ELECTRO ARTS offer electro pneumatic system providing multiple benefits for the user. The system consists two push buttons and a controller. When both the push buttons are pressed, the output relay from the controller gets ON. When both the switches are operated, the output relay gets on for 1 sec and automatically gets off. The controller will operate a solenoid valve which in turn will operate a pneumatic cylinder. This pneumatic cylinder is used to pull the DOG of the rolling key press. Once the DOG is released fro position , the stroke is completed. The stroke is allowed once only when both the switches are pressed at a time. The multiple stroke will not be continued if both the push buttons remains continuously pressed. You have to release the push button and press again. So both the hands of the operator are engaged to operate press. 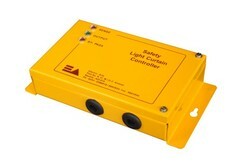 Safety light curtain can be connected with the controller. When safety light curtain is installed, operator will not be able to start the press when hand is blocking the beam. When some object is there between the two sensors, the output relay will not get ON even if the both the PUSH BUTTONS are pressed. In mechanically operated press, operator has to press heavy paddle, in order to operate the stroke. However in this case , being simple push buttons,it is very easy to press the same. This will increase Output of the controller is provided through two relays with their contact in series. This is to provides enhanced safety. 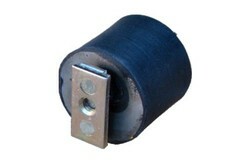 Waterproof Housing for Safety Light Curtains is available for selected models as shown is photograph. Such housing is required for Emitter and Receiver separately. With such watertight housings, Safety Light Curtains can be used in the area where water is being used extensively for cleaning in nearby area. Without watertight housing, water droplets enters housing of safety light curtain and damages / stops functioning of the unit. It is made from transparent acrylic tube so that IR rays can pass through them. 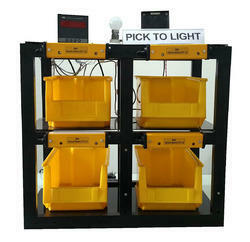 Picking lights will eliminate errors.- Additional features can be offered as per user requirements.- System can be offered for 8 / 16 / 24 Number of Bins.- Required Sequence can be set by user whenever required- Few Sequence options can be stored in Memory so required sequence can be selected.- System uses Infra Red Retro-reflective Sensors for verification. (Sensor :41x36xL mm)- System gives audio and light indication upon detection of sequence error.